Juan, our youngest worker at 16, is going up - with buckets of adobe mortar for his maestro to use to fix the bricks together. 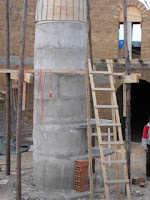 The central column is going up - looking more and more like a beefy tree trunk with every added concrete ring. The cow is going up, seemingly walking along our garden wall! 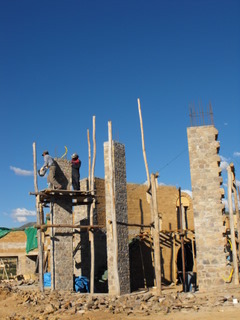 And the four 5 metre columns that will be filled with glass are finally completed, after four patient and dedicated months by Geronimo and Freddy. All the stones were selected from the land and carefully placed in position, day after day, week after week. We start shaping the internal walls of the two terraces. 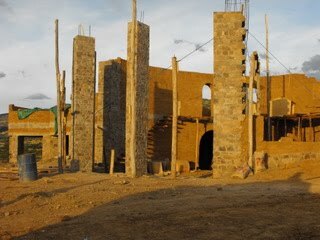 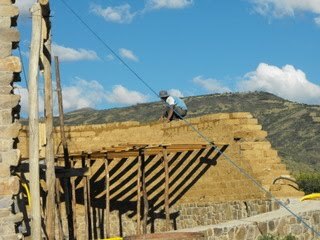 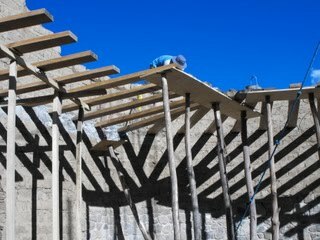 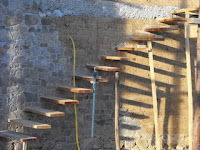 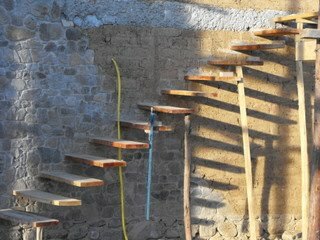 With the floating staircase complete, we start inserting the beams that will support the mezzanine into the adobe walls. 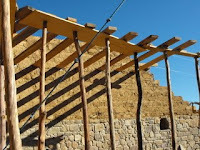 They are curved around the corners toward the main entrance to the house. An arched door is created to provide access from the mezzanine onto the terrace. Then the walls are built up above the mezzanine. 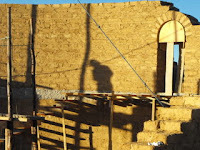 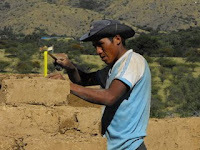 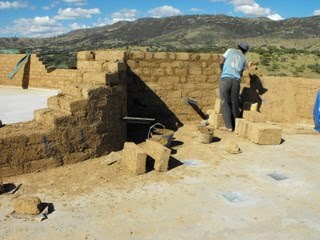 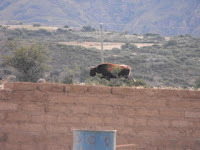 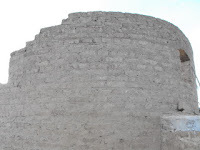 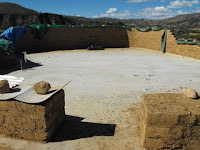 At 70 cm wide, they eat up our adobe bricks, and we have two workers permanently employed making more. 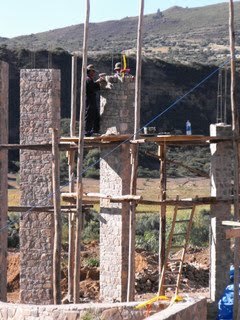 Geronimo and Freddy continue the long, slow process of building the 5 metre columns that will frame the view to the mountains. 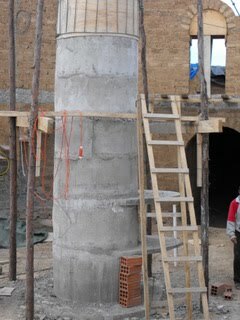 Hipolito works on the central column in the living room, incorporating the concrete shelves that will eventually be welded and glazed to form a woodburning stove. 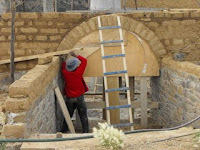 As the wall moves around to the main entrance, we insert the largest arch to form a grand entrance to the living room. 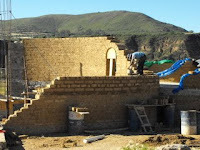 We also build up the side walls leading down the steps to where the large wooden door will be placed. 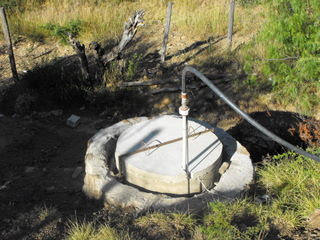 Even though we have been using our well for some time, it was not secured against the theft of our pump (a common problem in the countryside). 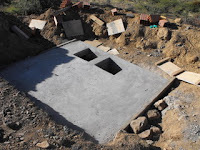 So Ed got a couple of our workers on building a hefty cement lid. 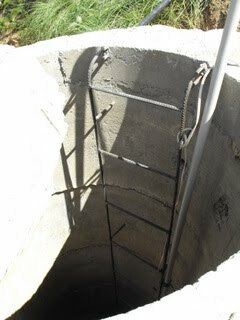 When this was done the lid was secured with reinforcing steel and padlocks, so we could leave the pump permanently in the well. Ed also welded an inspection ladder so if there were problems we could safely climb the 15 metres to investigate. 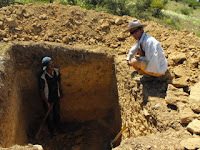 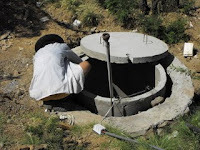 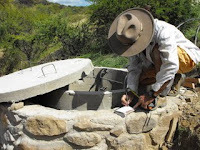 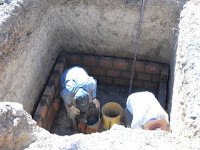 We also started work on making a cistern for grey water collected from the house. 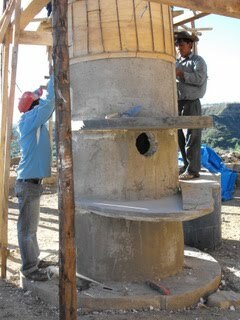 This would be filtered through sand beds and finally be used to water fruit trees and vines to be planted on the slope later in the year.